I love Valentine’s Day! My husband Mike and I always make a point to celebrate (but we also celebrate year-round, really). I don’t mind the commercialization of it – if there’s another opportunity to spend time with my loved one, then why not? This year as Valentine’s Day falls on the Family Day long weekend, Mike and I will be heading out of town for our Valentine’s celebration, but in the last few weeks I’ve had a lot of interest on the 2015 Things to Do in Edmonton for Valentine’s list I did up last year, and a few people have asked if I was going to put out an updated one for 2016 so, always trying to please the people, I have! Here’s a list of date ideas I’ve put together to help you plan your Valentine’s Day/Weekend in Edmonton! Some of them are repeat suggestions from my 2015 list because I think the ideas still apply for sure, but I have added some more new ones for 2016 too. Note there is more than 30 as I’ve been adding other suggestions from readers/followers too! Also note that many of these are good to do with friends too. 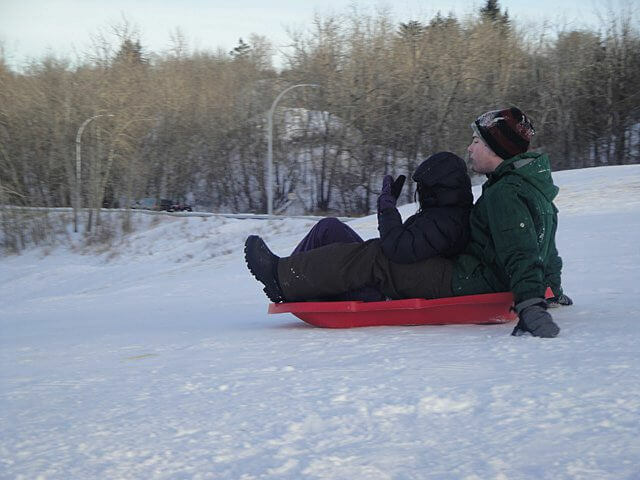 Go on the City of Edmonton’s Sweetheart Snowshoe adventure! Enjoy a guided snowshoes walk with your sweetheart through the natural beauty of the River Valley! The walk includes hot chocolate and bannock making, and snowshoes are provided. It’s $30 per person from 6:30-8:30 on Feb. 12 or 13. Hit the ice and go skating at the new Edmonton Freezeway in Victoria Park, the City of Edmonton’s Valentine’s Day Disco Ice Skate, which includes 1970s and ’80s music, roasting bannock, and hot chocolate at Churchill Square (the 2013 event pictured above – courtesy City of Edmonton’s Photo Gallery). There are also free skate and helmet rentals! Or head indoors to West Edmonton Mall’s Ice Palace, or just hit up any rink around town. There’s just a strip of ice in a field by our house that a lot of people in the neighbourhood go to for a quick skate, I’m sure there’s one near where you live! Challenge your wits and go on a double (or triple date) with your friends to one of our many awesome Edmonton escape rooms. You’re locked in a room for 45 minutes, presented with a scenario and have to solve through many puzzles and challenges to escape the room! My favourite rooms are at Escape City and GTFO Escape Entertainment. I heard BreakOut also has a new room that’s supposed to be fantastic. Book your room early before they fill up! Mike and I had an awesome brunch at Hotel Selkirk Fort Edmonton Park – book your Valentine’s Sunday morning brunch and show! There’s also a Lovers’ Getaway (stay at the hotel, get a four-course dinner + breakfast!) or do their dinner and a show in the Capitol Theatre. And speaking of brunch, since Valentine’s Day falls on Sunday this year – there are no shortage of brunch options! Tweet me for some of my brunch recommendations! Volunteer with your sweetie! Book with one of the numerous charitable organizations in Edmonton and see how you can help them on Valentine’s weekend. Cook a meal for families in need at the Ronald McDonald House, volunteer with an animal rescue (just google Edmonton animal rescues or ask your favourite if they need help with anything for that weekend!) Here’s even more charities in the Edmonton area you can support based on type/interests. Have you visited the Ice Castles in Hawrelak Park yet? It is so stunning – stopping by with your boo, day or night, will make for some lovely views/photo opportunities. Book online in advance, and take it up a notch by hiring a professional photographer (or a single friend, lol) to come along with you and get these once-in-a-lifetime couples photos set against the most incredible icy, winter backdrop! What a great winter adventure at the Ice Castle in Hawrelak Park! “Meet Me At Lover’s Lane” at the Silver Skate Festival! Silver Skate has a lovely Valentine’s weekend special for couples including hot chocolate, festive lanterns, a horse-drawn sleigh ride, followed by all the free activities at the festival. You can also do add-ons like chocolates from Jacek or Ice Castle admission! If Mike and I were in town for Valentine’s Day this year, we’d for sure be going to our favourite occasion restaurant: XIX Nineteen (in Terwillegar or at their new location in St. Albert!) “Fall in love all over again” with their 3-course Valentine’s meal. You’ll also find Valentine’s meal specials at almost any restaurant in Edmonton – just call and check at your favourite spot or see this list of Edmonton Valentine’s restaurant specials through OpenTable. Most of those special set dinners can be pretty pricy though – how about creating your own Valentine’s food crawl? Pick an area of the city – Whyte, 124 Street, Alberta Avenue, Chinatown, Little Italy, Stony Plain Road, Downtown, map out a walking route of 4-5 restaurants, and spend an afternoon or evening visiting all of them, sampling just appetizers and ending with dessert at the last place! You could have a pretty badass date night by visiting Axe Hole – Axe Throwing, a fairly new company in Edmonton. Be sure to take lots of photos and use the slow-mo video option on your phone when your significant other is throwing! Take a cooking class! There’s an express class from Gail Hall/Seasoned Solutions ahead of Valentine’s, or a few different weekend options at Get Cooking (including a Valentine’s brunch too!) You could head over to NAIT’s Culinary/Continuing Education and do their Feb. 12 Valentine’s cooking class, check out Sorrentino’s date night/interactive Valentine’s dinners, or did you know President’s Choice offers a bunch of really, really cheap cooking classes that are also kid-friendly? Head over to Sugar Swing Dance Club’s Valentine’s Social! They’ve got beginner lessons and sweet treats. Wine, wine, wine! Winefest Edmonton is the Valentine’s weekend so get your tickets and indulge in a whole lotta wine with food pairings. Recreate your first date! Me and Mike like do this on our togetherversary every year but I think it would be pretty fun on Valentine’s too. Where did you go and what did you do for your first date? Go back there, do it again! Or pretend you’re going on a date for the first time and use different identities. Like Phil/Clive Bixby in Modern Family, lol. Go on a date with different identities! Make it a productive Valentine’s weekend by catching some Oscar Best Picture-nominated movies! You could likely watch them all if you plan your movie marathon right. Big fan of Disney? Check out Disney in Concert: Tale As Old As Time at the Winspear Centre for Valentine’s weekend! Great for families too. There are still some Valentine’s weekend dates available for Paint Nite Edmonton! Let out your inner artist. Would definitely recommend you book this ASAP if interested because they typically always sell out. Also check Groupon to see if there is a discount code, or ask people who have been to recent Paint Nite’s to see if their host gave them a discount code! You could also go with Arty Party Edmonton and book a bigger group Valentine’s weekend paint night. Comedian Orny Adams is doing all the Valentine’s weekend shows at The Comic Strip in West Edmonton Mall. Love to laugh? Going to a comedy show for Valentine’s weekend could be a lot of fun! Or catch some of the best live improvisation at Rapid Fire Theatre. You can also do the free stand-up show at The Druid on Sunday/Valentine’s evening, though it’s also the Sunday before the long weekend and sometimes the crowd is not too great on long weekends, lol. Or do dinner and a live show – “The Last Resort” at Mayfield Dinner Theatre or “Michael Jackson is Back From The Future” at Jubilations! Unwind, unknot, relax, with a couple’s massage. Bliss Yoga has a few options. I also like going to Alberta Momentum Massage (though they don’t actually have a room big enough for a couples massage, you could just book at the same time and do it in separate rooms). Buy some bubble bath (or bath bombs), and take a long bath together! Ensure there is wine (if you’re into wine, I’m not, lol) is nearby, maybe some mood lighting (candles) and some soft music. How sweet! Is your significant other into beer? You can do a few different brew tours in Edmonton including Alley Kat’s Brewery Tour or Yellowhead Brewery’s Tour. With the amount of options to choose from on Netflix, you can’t really go wrong with a Valentine’s weekend Netflix binge-watch. Select a show, and power through! The key to making this extra Valentine’s-y is to cuddle up. Mike and I also like moving our bed to the living room when we are on weekends/Netflix binge-ing! Interested in star-gazing? I’m not sure how the Telus World of Science Observatory is set up, but how romantic would it be to lie and stare up at the sky through their observatory? Call the Box Office/check their site to make sure the observatory will be open (really dependant on weather). Remember the ’70s version of The Dating Game? On The Rocks will be putting on a fun twist on that live for Valentine’s Day, hosted by comedian Sterling Scott. For even more ideas, check out YEG Date Night!